A headache is a common neurological disorder, and large numbers of patients suffer from intractable headaches including migraine, tension headache and cluster headache, etc., with no clear therapeutic options. Despite the advances made in the treatment of headaches over the last few decades, subsets of patients either do not achieve adequate pain relief or cannot tolerate the side effects of typical migraine medications. 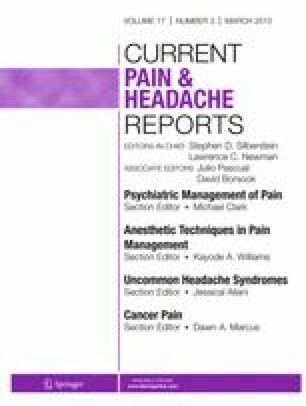 An electrical stimulation of the peripheral nerves via an implantable pulse generator appears to be good alternative option for patients with treatment-refractory headaches. A number of clinical trials show considerable evidence supporting the use of peripheral nerve stimulator (PNS) for headaches not responding to conservative therapies. However, the mechanism by which PNS improves headaches or predicts who will benefit from PNS remains uncertain. The decision to use PNS should be individualized based on patient suffering and disability. Hence, further work is imperative. Here, we discuss the mechanism, indication, efficacy, implant technique, and complications of PNS. Dr. Billy Huh is consultant for St. Jude Medical and Boston Scientific. Dr. Pyungbok Lee reported no potential conflicts of interest relevant to this article. Antibiotic prophylaxis in surgery. Available at http://www.surgicalcriticalcare.net/ Guidelines/antibiotic_prophylaxis.pdf. Accessed September 2012.